This morning, I went to my favorite place in Antalya. It is a simple pastry shop, which is open between 7-12 in the morning. 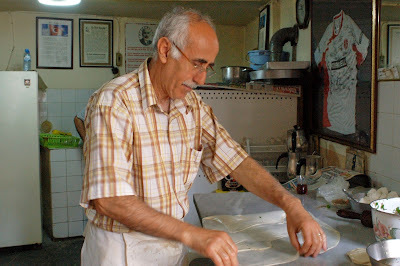 Tevfik Usta, or Master Tevfik, has been making this Antalya specialty for over 40 years. 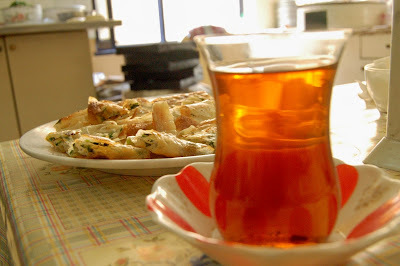 He has two kinds of 'serpme börek' as said in Antalya, one with a ground meat filling, other with cheese filling. But you may have the cheese börek -which he makes with unsalted cheese- with powdered sugar as a dessert. So with that choice, you have three selections. Since I'm not a meat eater, I eat my cheese börek each time I go there. He knows how I like. Cheese, parsley and black pepper. Then he rolls my pastry, turns it few times on his hand to make it thinner, folds like an envelope, adds the filling, folds once more and bake until it gets crisp. Not only the börek he makes, but also the atmosphere is magical. I feel like I'm at home. I watch him make the pastries, mesmerized. Peace fills me while watching. My gift is the warm pastry and a glass of tea. Isn't that a wonderful way to start the day? Would you vote for Zen in the Kitchen at the www.bloggerschoiceawards.com website for the best food blog and best blog of all time categories? You can see the link on the right. This simple, spring meal is a gift to a dear friend, who makes me so happy with his friendship, who brings meaning to my life by sharing insights, smiling and thoughtful moments. So I cooked this little vegetarian meal today. 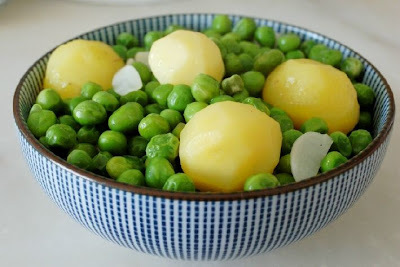 I cooked fresh peas in virgin olive oil from the Aegean region of Turkey, rock salt, black pepper and lots of young garlic (almost one head). I boiled young potatoes I got from the tuesday market, which are grown nearby. I peeled the skins of the potatoes, added them to the pot. Now they are ready to eat. I'll be praying in silence and will share this meal with my family, thinking of a dear friend who is so far away but at the same time so close, as close as my skin.